The phone call Winnipeg Free Press editor Margo Goodhand made to Stephanie Forsyth to have a chat about The Great Canadian Talk Show, was no spur of the moment act. 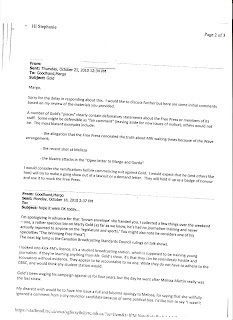 As the email Margo sent to the Red River College president to continue the attack on Kick-FM host Marty Gold proves, Margo had embarked on a trial run of her accusations and half-truths first. Just trying to be helpful, no doubt, she sent proof that the self-righteousness of her crusade against scrutiny and accountability by campus radio, was sanctioned by a higher authority. Not by FP publisher Bob Cox. Not by owner Bob Silver. But by their lawyer, who had received a (WRHA-surplus) brown envelope earlier that week, with "a few things" Goodhand collected over the weekend. 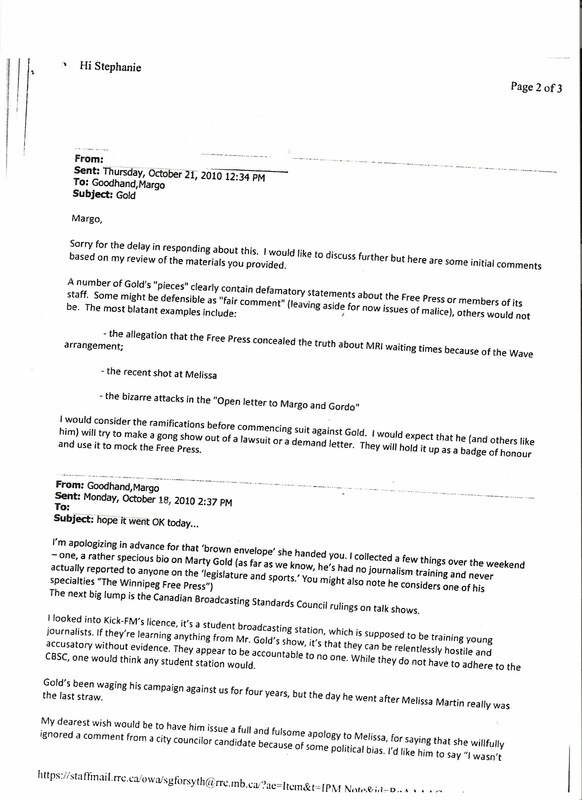 "a specious bio on Marty Gold" wrote the alleged journalist, who proceeded to claim "as far as we know, he's had no journalism training and never actually reported on the 'legislature and sports', ", urging counsel to "also note he considers one of his specialties "The Winnipeg Free Press". " Ignoring completely the mandate of campus radio to also train volunteers from, and provide programming for, the community-at-large, she zoned in on licence to train young journalists from RRC's Cre-Comm course. "If they're learning anything from Mr. Gold's show, it's that they can be relentlessly hostile and accusatory without evidence". Margo then fumes to the lawyer "the day he went after Melissa Martin really was the last straw." "My dearest wish would be to have him issue a full and fulsome apology to Melissa, for saying that she willfully ignored a comment from a city councillor candidate because of some political bias. I'd like him to say "I wasn't there myself, I was reporting third-hand knowledge that has proved not to be true, and in the process I not only defamed Ms. Martin and the Free Press, I practiced the lowest kind of journalism, of innuendo and ignorance. Um, that's the wish, anyway." Margo is about to have her wish evaporate before her eyes. 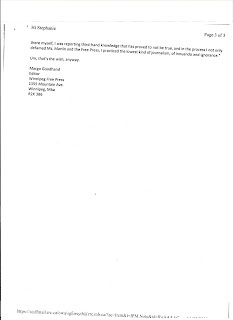 We discovered an email Ms. Martin sent to a reader of Anybody Want A Peanut, who posted it in the comments underneath blogger Cherenkov's review of our Dec. 7th live event -- where we exposed Margo's role in the cancellation before we ever got ahold of Margo's missives to Stephanie. I sent an e-mail to Melissa Martin asking her if this story was true and this was her response. Do we believe her? "It depends on how you define “truth,” I suppose. I didn’t report accusations about Eadie engaging in, basically, election fraud. That’s true. the long story short of that is because the only evidence I, and several other reporters far more talented and experienced than I, could find came from an individual with a vested personal interest in seeing Ross Eadie lose the election… and this person would not go on the record. One of those "experienced reporters" wouldn't have been her colleague Bartley Kives, would it? The same Bartley K. who received a VERY on-the-record email from an eyewitness on September 30th, asking where she could file an official complaint ? He never did give her an answer to that question. The same BK, who along with the devine MM, didn't bother to call Mynarski election panel moderator Rob Galston asking what he heard standing 5 feet away from Eadie? (TGCTS spoke to Galston, and he tells us no other reporter ever has called him to ask). Yes, he said he needed the backing of the NDP to finance his campaign. In the email, Ms. Martin then proceeds to show her confusion between her job of reporting election complaints, with the job of the Senior Electoral Officer. We can’t put serious allegations in the paper unless we have strong evidence to support them. The stronger the allegation, the stronger the evidence needed, for obvious reasons. "People are free to draw their own conclusions about the truth behind the accusation, and chalk the lack of a story up to a failure in my investigating, which I would consider to be fair." But it is not truthful to assert or imply that I deliberately didn’t write the story for any purpose other than my failure to find evidence, not for a story I could put my name on, put in the paper, and sleep at night knowing that I did the right thing. "Doing the right thing" for the newspaper when River Heights Councillor John Orlikow flung accusations about dirty election tricks like the provincial Conservatives forming fake lobby groups to help challenger Michael Kowalson, was to frame the story as, 'Candidate complains about opponent'. When it came to Mynarski ward, the NDP candidate admitted he could not afford to run without the help of the New Democratic Party, and opponents and witnesses came forward on the internet and in emails. Yet the newspaper of record ignored the evidence and couldn't grasp the obvious when the story never appeared in their pages. Bloggers and listeners of TGCTS noticed the huge contradiction in the Free Press and other media outlet's reporting practices, between accusations going from left to right, and vice-versa. Some accusations, it seems, the newspaper could just publish with no "investigation", but a serious one from multiple witnesses about the ruling NDP possibly breaking their own election finance law a year after being exposed for cheating in the 1999 provincial election, somehow could not even be wedged on page 2 between the Our Mistakes and the humour column. But that's Margo's department, isn't it? 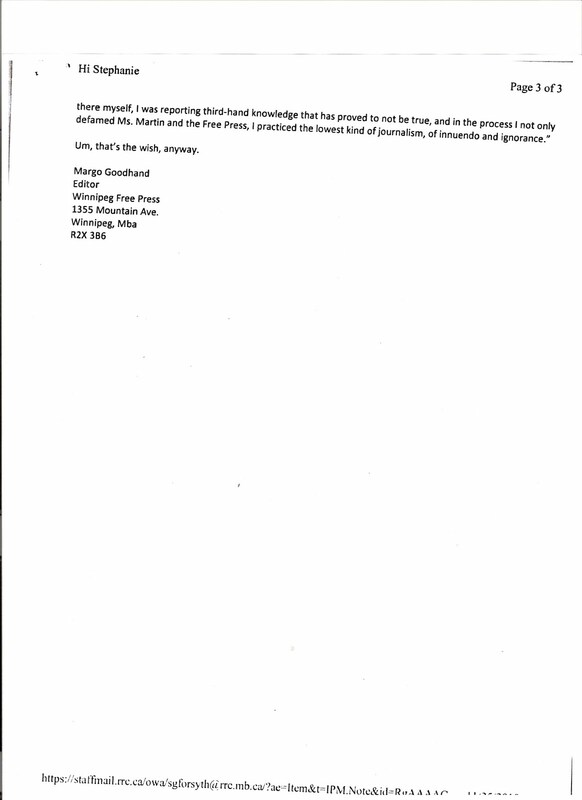 Melissa Martin admitted she did, in fact, deliberately ignore a comment from Ross Eadie that led to not only an email to the Free Press city hall reporter, and at least 4 complaints to the Senior Electoral official Marc Lemoine that we know of. We have also learned that the outrage that sent Margo into a frenzied attack on the only broadcast outlet that reported on the Ross Eadie election complaints, had nothing to do with TGCTS or a complaint from Melissa Martin. I never “complained about Marty Gold” to Margo… that doesn’t even make sense. I only talked to her about anything related once, the first day I saw the Eadie thing going around on Twitter. This was maybe a week before I heard about it being on TGCTS, in that ballpark. So why did she run to Margo, if it had nothing to do with anything Marty Gold said, you ask? I was worried and wanted to explain the story to her in case she started getting letters making accusations about my ethics. It was a brief conversation but she reassured me that they trusted me and knew how seriously I took my work – that discussion was about ME. I really don’t remember if there was “crying involved.” It’s possible, I’m a total crier, which everyone knows, haha. Yet Margo told her lawyer that TGCTS was guilty of "the lowest kind of journalism, of innuendo and ignorance" --- and then sent it on to Stephanie Forsyth after telling her on the phone we had made Melissa Martin cry by criticizing her non-reporting of the Ross Eadie election funding scandal. "I would expect that he (and others like him) will try to make a gong show out of a lawsuit or demand letter. They will hold it up as a badge of honour and use it to mock the Free Press." "when there is no balance, no fairness, no accountability in (a) barrage of criticism - all the tenets of good journalism --it becomes an issue." Still to come: Margo wasn't done with her pen pal yet.